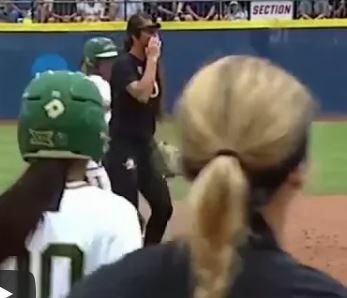 This video is a play from the 2017 College World Series discussing who covers 2nd base on a fly ball to right field with runners at 1st and 2nd. The logic here is that with the outfielder coming in on the ball, 2nd base is not needed for a relay. Shortstop should line up between the ball and 3rd base as a cutoff looking for a play on the runner from 1st if there is no play at 3rd. In this video the shortstop seems to be in proper position, the 2nd baseman does not get to the bag causing the Shortstop to move that direction. Checkout our post discussing the differance between a relay and a cutoff for more information. As with all of the situations which arize on a softball or baseball field there is no one right way to do things, the key is simply to be sure players know what their roles are and execute their roles to perfection.